Back after another month! I've been very, very busy with schoolwork this semester. It is that time of year when final exams and projects take over my life, but they're just about over! 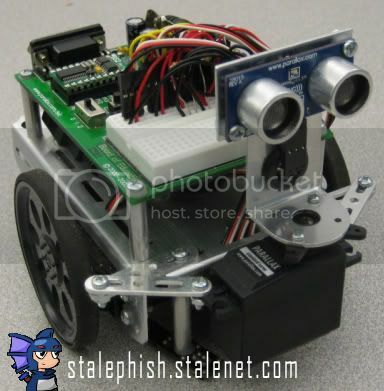 It is a Boe-Bot robotics kit from Parallax Inc, a company that makes robot parts and such. I had a course this semester which required me to design and code software for this robot, which I also had to build using a pile of parts. Aside from the wheels on the sides and the chassis, I selected three "QTI" infrared sensors to take readings off the ground at the front of the robot, and a sonar on a rotating servo at the front which gathers distance readings of objects in its proximity. The robot was designed to be self-aware, so it ran the course based on rules and algorithms which I designed. Once I flipped it on, it ran completely by itself to the end of the obstacle course! I spent a few months testing out various hardware, including such things as light sensors and whiskers. The software was written in PBASIC, a custom version of BASIC that Parallax ships with its BASIC Stamp embedded microprocessor. So now to get away from the technical words, the robot had just one requirement: start at point A and end up at point B. The real problem was what the robot had to do in between to get there. Starting off, it had to go inside a cardboard box (cave), seek the exit and find the road (black tape on a white table), follow it until it found the a curving pylon course (paper cups) that it had to navigate through, and finally solve a maze (cardboard bricks) to the exit! Here is a video of my robot solving the course from start to finish in just two minutes!